Today, Irving Henkin, my great Uncle, would be 123 years old. But he took the place of 2 absent grandfathers, so I credit him with 2 lifetimes. I have never been to his grave, and though I light the Yahrzeit for him each year, to me it's more akin to a birthday candle. In my heart he's never really passed and I speak with him often. Here is a bit about him from something i wrote in 2009. Issac was later known as Irving - due to the tall tales he told we sometimes called him Uncle “Lie”- but he was always Uncle “I” as far as I was concerned. He was born, alternately, depending upon whom you asked, in Vineland New Jersey, Philadelphia, or New York City. Everyone agrees that it was on Aug 15th- but the year varies- 1893, 1895 or 1898 - take your pick. He was old enough to collect Social Security when I was 5 but worked until a year before he died in 1975. 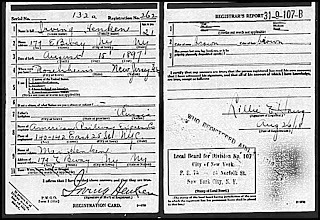 And he was too young to serve in World War I- registering in August of 1918, just 3 months before the Armistice. He probably was trying to avoid detection as an illegal for fear of being sent back to the "old" country. 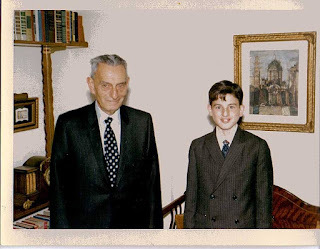 His father had crossed the ocean to escape Europe and Irving had no desire to retrace “Pops” steps – he didn’t want to go back - as a deportee or a soldier. He apparently worked for the American Railway Express Co and later went into the Garment Industry as a buyer of furs. He used to bring me samples and to this day I can tell real from fake chinchilla, mink, sable, rabbit and even lamb. We had raccoon tails by the armload and attached them to the handlebars of our bikes and the backs of our hats, and even flew one from the antenna of the old Plymouth. When I was younger, he would take me, and later, when I was older, I would meet him at the furriers where he worked on 7th Ave in the Garment District. The cutters, the tailors and sewing operators all treated me royally and I was fascinated by this aspect of my Uncles life. The Friday night walks were the most special times I spent with Uncle “I”. In spite of his age he never failed to make that 1 hour trip each way to watch the news, eat dinner and "talk" a walk with me. By "talk" a walk- I mean that we would talk and walk. We would go to the candy store on Kings Hwy and 15th Street and he would buy me an ice cream soda and afterwards give me a Standing Liberty or Benjamin Franklin half dollar. And when "magic time" was done I would walk him around the corner to the Quentin Road entrance of the BMT for his 1 hour train ride back to Manhattan. They said he had no where to go, but I know better- he came to see me. He took me to baseball games at the Polo Grounds, Shea Stadium, Yankee Stadium, to the circus at the Old Madison Square Garden, and to Radio City Music Hall for the Christmas Show. He was Jewish to the core, but the blue lit Nativity scene, complete with real Camels on stage - made him weep from the majesty of it. He knew every doorman, every usher, and every cabbie. We would go to the Stage Delicatessen on 7th Avenue and he knew all the comedians, actors and characters there, including the owner, Max. If I characterize this part of Irving’s’ life as mysterious, it is probably because I never once went up to his hotel room. I suppose he considered it improper or ill advised to take a child up to his room with him. But he gave the most important gift of all to me. His time.